London mayor Boris Johnson reportedly flew to San Francisco in February 2013 in hopes Apple would sponsor the city's "Garden Bridge," a proposed pedestrian walkway spanning the River Thames. Apple executives were pitched on the idea between February 3 and 5, even though Johnson's administration had yet to give official backing to the project, according to sources for The Architects' Journal. The bridge's designer, Thomas Heatherwick, was also allegedly present despite not having actually won that title yet. Critics have accused Heatherwick and Absolutely Fabulous actress Joanna Lumley of having biased Transport for London's bridge contest in their lobbying of Johnson. The mayor's trip was also reportedly financed by taxpayers, a potentially egregious violation of rules considering that the procurement process for the bridge hadn't been completed. News of the scandal first emerged last month, but at the time, Apple's involvement was unknown. At an oversight committee on Dec. 17 Johnson agreed to release the names of people who had participated in the San Francisco trip —though not immediately, as he claimed this would bias talks with the unnamed sponsor, saying there were "some quite promising lines of conversation." A source described as "close to Apple" told the Journal that Apple has "no involvement" in the bridge project, and is moreover "not considering getting involved." A mayoral spokesperson confirmed that Johnson met with the company in 2013 to discuss "investment opportunities in London," but said that Heatherwick was only coincidentally in California meeting with Apple for a "separate commitment." 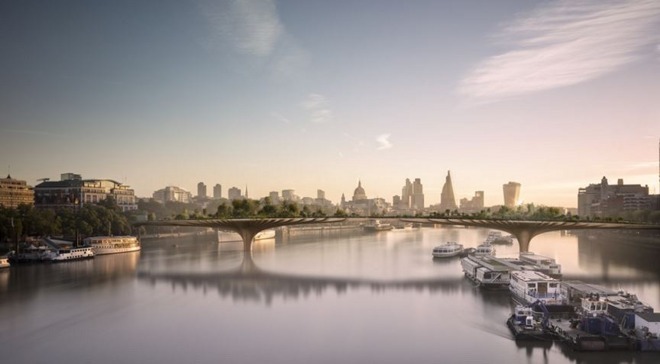 "Given that he [Heatherwick] had already expressed interest in creating a Garden Bridge, the Mayor invited him to join the meeting and outline his ideas," the spokesperson added, insisting that this had no impact on the bridge's procurement process. Apple generally doesn't sponsor buildings or other landmarks, so it's unclear why Johnson would've approached the company aside from its billions in cash reserves.